But color us skeptical. The pictures appear to have been sent in anonymously (“Okay, we obviously can’t confirm this…” the post starts). And trying to explain the bolts around the edge, Engadget suggests it has been bolted to the table. Bolted to the table? WTF? Why would it be bolted to a table? And what’s going on in the picture below, in the bottom left corner of the screen? It looks like the screen is transparent, and its showing a support of some kind underneath. Or is it a reflection? Perhaps it is an Apple prototype, but a tabletop system, like Microsoft’s Surface table? In the picture below, at the bottom of the screen, is the reflection of what looks like a utility pole (with transmission wires running left to right) and the image of the photographer, who has been whited out. 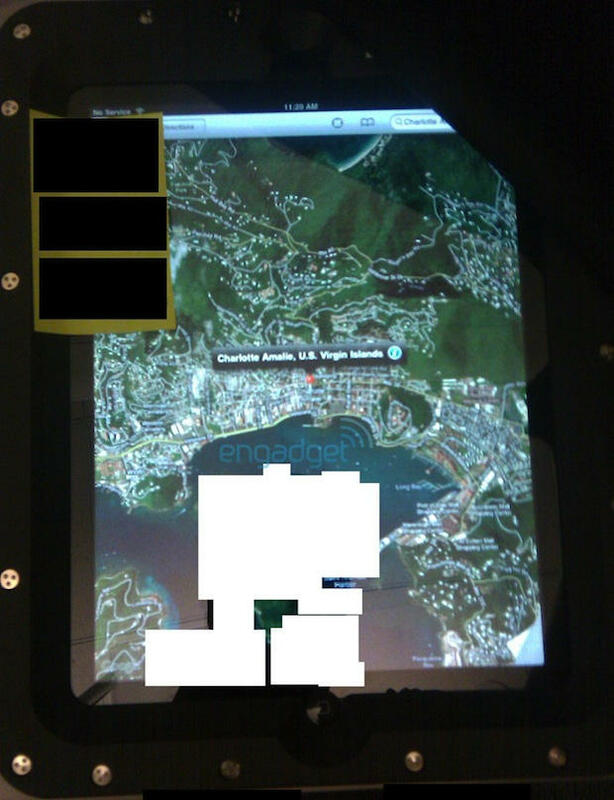 So the picture was taken outside (in the U.S. Virgin Islands perhaps? ), while the picture above looks like an indoor shot. 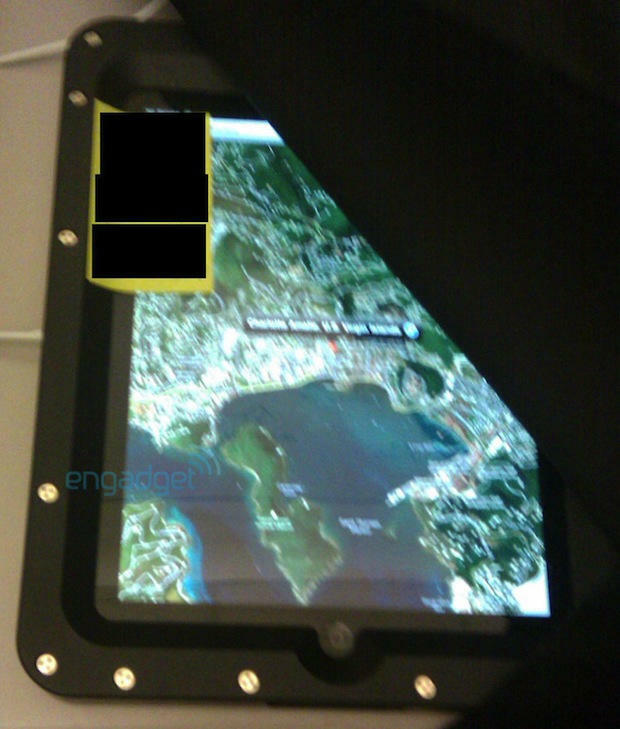 The tablet seems to be sitting on a tabletop, with white wires running underneath — perhaps the AC charger and headphones. Note the Home button sitting right in the middle of the shortest edge, plus the recessed screen. It looks to be the same size and shape as a tea tray. The bolts around the edge are reminiscent of the bolts used in the stairs at Apple’s stores, and the pivot arm of the old G4 iMac. However, it seems unlikely that Steve Jobs and Jonny Ive would leave bolts exposed in the final design. Still, after being initially highly skeptical of these pictures, they’re now starting to look more real. What are the blacked out labels though?